New Blogger Initiation! Pledge by Tuesday, August 14th. For a few weeks now, I have had this idea bouncing around in my head. A new blogger initiation! All it involves is writing four blogposts. There will be no hazing of any kind, except for the kind where we all say how much we think you’re awesome. That’s a form of hazing, right? Like happy hazing? It has recently come to my attention that there are about a zillion new math teacher blogs that I don’t know about. They are new and probably awesome and exciting and fresh. I also have come to find out that there are a bunch of lurkers who are reading and absorbing and loving the math teacher blogs out there, but are on the fence about blogging themselves. For those who have taken the leap and started blogging recently: awesome!!! Welcome! Define recently however you want… 3 months, a week, half a year, whatever… if you feel like you’re a new blogger, you should read on! This is for you!!! If you’re a lurker but don’t yet feel like you want to blog, maybe you just need a little encouragement and motivation to get you to start. There’s a site with an awkwardly long url that a bunch of people created with the sole purpose of convincing you how awesome it is. If you’re nervous about writing, read this footnote . New and new-ish bloggers pledge to participate. This is to help kickstart you into actually doing it. You sign up. There isn’t any time limit on what constitutes a new blogger. If you’ve never blogged before, you’re definitely good to go. If you feel new, or just want to participate because you’ve been lagging in your blogging and you need to rejuvinate yourself, sign up! Each week for a month you will be emailed a mystery prompt (but it will be rich and evocative and you’ll want to write about it) — and given a week to write a blogpost on that prompt . Short, long, picture-based, whatever. No pressure. Just get something down! This will happen just four times… In your email, you’ll also get instructions on how to submit your blogpost once it is written and published on your blog. Each week, I (or hopefully me and a few other bloggers) will compile your posts and share them with the rest of the blogosphere by linking to them from our pages. This way we’ll get to say hi and get to know y’all, and you’ll get to say hi to each other, and everyone will be happy. Of course you can write as many other posts as you want. This is just hopefully a way to kickstart you into starting or keep you with us if you’ve just started! And remember, if you need help starting a blog, we have a site to help you! 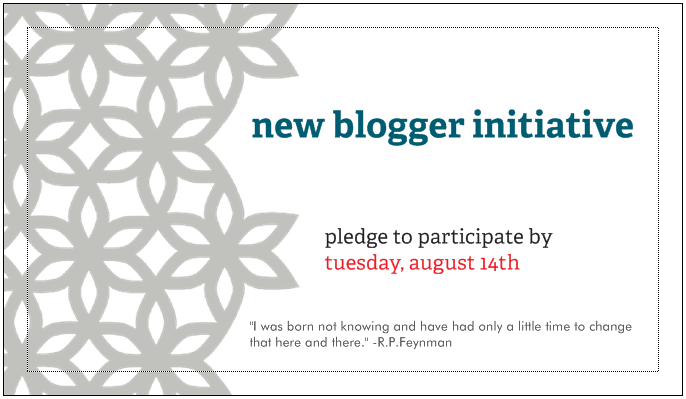 All you need to do if you’re a new-ish blogger and want to pledge to participate is to sign up below by Tuesday, August 14th. You’ll get your first mystery but awesome prompt via email soon thereafter! UPDATE: SIGN UP IS OVER! FORM TO SIGN UP HAS BEEN REMOVED. Do you think you’re bad at writing, so you don’t want to blog? HELLO HOLA we’re math teachers so we don’t care. We don’t snicker when someone writes there instead of their, or misuses a word. Do you not have time to do it? Just try it out for a month and see if it really takes more time that you have! Do you think you aren’t creative or interesting enough or have anything to say that would interest anyone. SHUT THE FRONT DOOR. Seriously, we all feel this way. We just put it out there. And writing even about the smallest things like a bell-ringer/do now that you like, or musing on an article about education that you found interesting or disheartening, or a single math problem you found interesting, or recollections of one of your favorite math teachers, or whatever. Heck, I just learned the most amazing trick about how to teach matrix multiplication from a teacher who thought that everyone taught it that way. I love the little things. It’s a secret what these are. Im on board to help out as well! Where do ya need me? I’m in…I’m one of those who are guilty of saying, “I’ don’t have time to blog.” I have now “assigned” myself to blog about a new project I’m undertaking this year, so stay tuned. Thanks, Sam! Ooh, One more thing: My blog Name is roughlynormal.wordpress.com , no longer “roughlynormalteacher”. My twitter feed is @roughlynormal. Let me know how I can help. I love how many blogging initiatives are going on right now! I will try to remember to do that! Maybe in the 3rd or 4th email / week of blogging! This is perfect for all of you who are newer to blogging or even just want to get back into it. It will be amazing fun! Thanks Sam. I will share this with my staff. THis sounds like a great opportunity for teachers to get started in on the world of blogging. I know that blogging has empowered me and made me a better teacher by learning and sharing with others. Any chance the topics for new bloggers will be posted for the rest of us to use as well? I’ve had a blog for a long time, but it doesn’t get used much and I mostly put fluff. It would be nice to change that. Right now I mostly lurk a lot. Just sign up! No worries if you aren’t new – if you are feeling like you need a change or to get started up again, sign up! I will help however I can :) This is an awesome idea! I will happy to host a week, Sam. I’d be happy to help too. Kate helped me get started, and I’d love to pass it forward. If anyone wants a helping hand (I use blogspot not wordpress), you can email me at mathantholgyeditor on gmail. Pingback: Live. Teach. Create. | So You are a New Blogger? wish i could share this with my future colleagues at our in-services, but we don’t start back until august 20th. You could just organize your own mini one! This is fantastic. I can’t wait for my email! This is crazy I saw this tonight. I was just thinking that I should try blogging stuff from my math classes, especially since I teach Geometry, Algebra II, Advanced Mathematics, PreCalculus, and Calculus. I don’t know when I will have time, but this could really enhance my teaching I think, especially if I have other teachers joining in with me! This really is to just share ideas and I LOVE it! Glad I found this site! I look forward to learning from so many math teachers! You should probably do this. It’s what all the cool kids are doing. Is your goal to have this project be for math bloggers only? I’m a biology teacher and wondering if your four prompts would be relevant to my discipline as well. Thanks. Okay, Sam, I’m giving it a whirl. Hi Sam! It looks like you have had plenty of offers, but I wanted to let you know that I would also be happy to help in some way. Thank you for your leadership in the mathtwitterblogosphere! Hihi – I *think* I’m good, but I’ll definitely let you know if I need more. THANKS for your willingness to help!!! I’d like to *try* to do this, but … I tried to sign up to the twitterbloggysfear before and haven’t heard anything. The deadline to sign up was yesterday, so hopefully today. When will we receive the first mystery prompt….so looking forward to this! Like Sue, if you are one of the new bloggers and need some help, feel free to ask questions of me as well. I’ll help the first 5 people who ask at my blog (http://oldmathdognewtricks.blogspot.com/2012/08/new-math-bloggers-need-help.html). I’m also offering help, via twitter, to anyone who asks! I’m @crstn85 there and will be happy to answer any and all questions about starting up your blog. This is an excellent idea. I have started a blogging tutorial site, http://blogineering.com for new WordPress bloggers. This might be a great help for starters. I thought I signed up a couple of days before the 14th but haven’t received a prompt – email elizjvv_at_gmail.com, website http://mindbodymaths.blogspot.com, Elizabeth. Pingback: Technology Integration for Math Engagement » It’s All About TIME! Pingback: New Blogger Initiation:A Star Is Born | "Me Dot"
I just found this post and will be trying blogging for the first time. Is it too late to join? I think things are already in swing here. However, three things: (1) You should definitely still blog! And we made a site to help you get started: http://mathtwitterblogosphere.weebly.com/ (2) We will publish all the questions/prompts that we used in the new blogger initiation as soon as it’s over, so you can use those as inspiration to start, and (3) just do it anyway!!! Pingback: Sarah Educating - This is what being a teacher looks like? I never received week three prompts. Have had no other problems the first two weeks. Any way you could re email it out to me esteinmetz@perryschools.org ? I’m actually not in charge of the email list… but if you got the first couple emails, you should check your spam folder as it seems like the problem is likely is on your end. I have a colleague who just started blogging (after I heard about this challenge). I gather he’s missed the boat, but how could new bloggers connect with a network of other math ed bloggers to both see what others are doing and to find potential readers? When I began my blog in (whenever it was: 2006 or so?) I already had a network through which to alert people. I’ve put my colleague’s first blog post out to what remains of that network, but thought this might be a good place to check. Thanks for any suggestions, and good luck to everyone. I would send your blogger to this site, which has advice, tips, and other such things. Building up a readership basically just takes time, and posting regularly. That’s about it. But tweeting, commenting on other blogs, and just getting involved is really the best way to go about it. But I always say to anyone starting a blog that blogging for YOU is really all you should be doing when you start. You shouldn’t start a blog for others, but really to reflect on your own practices. But getting input on things takes time. That’s just the reality of it, methinks. Thanks, Sam. Appreciate it and will forward the information to Donald.